Insular Foundation Heads as they hand over the check donation to the representatives of Save the Children Foundation. From left: Insular Foundation Vice Chairman, Ms. Mona Lisa B. Dela Cruz, Insular Foundation Chairman and President, Ms. Nina D. Aguas, Save the Children Head of Strategic Partnerships, Ms. Riel Andaluz, Save the Children Corporate Partnerships Manager, Ms. Natalia Tabal and Insular Foundation Administrator, Ms. Ana Maria R. Soriano. Insular Foundation extended two hundred twenty thousand (P220,000.00) worth of educational help for the school children of displaced families in Marawi, through the Save the Children Foundation. 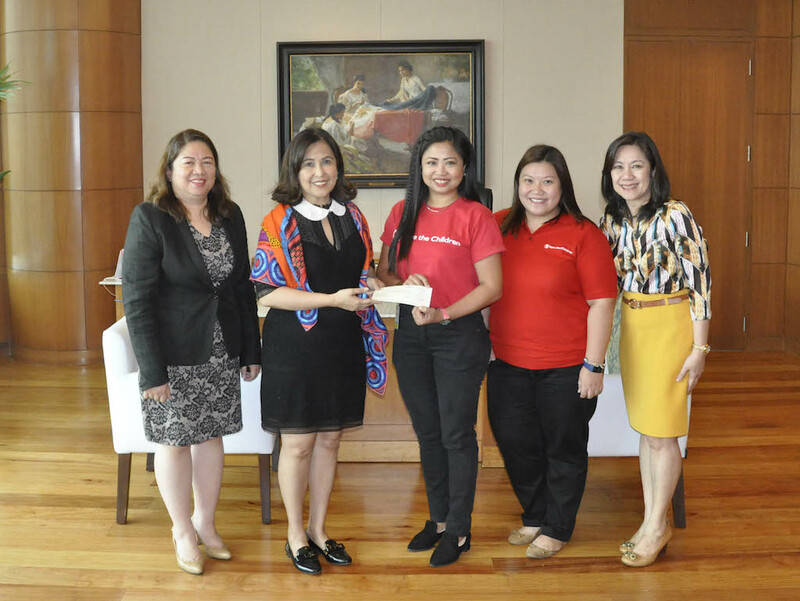 The check donation was formally turned over in July 4, 2017 by the Insular Foundation Heads, Ms. Nina Aguas, Insular Foundation Chairman and President, Ms. Mona Lisa dela Cruz, Insular Foundation Vice Chairman and Ms. Ana Maria R. Soriano, Insular Foundation Administrator to Save the Children Representatives Ms. Riel Andaluz, the Head of the Strategic Partnership and Ms. Aia Tabal, Corporate Partnerships Manager. The donation will be used to provide the displaced school children with 100 sets of back to school kits and build them Temporary Learning Space, plus teaching materials for the teachers. The sponsorship is a demonstration of support for the relief efforts being done in Marawi City being an armed conflict zone and is also consistent with the Mission of the Foundation to Help make lives better, by making sure that the basic services such as education is kept unhampered.